Upon arrival we were seated at a very nice booth with a super view of the restaurant and open kitchen to the rear. Just as before, the staff went above and beyond go make our visit a pleasure, and the service was excellent – everything took just the right amount of time to arrive despite the fact that the place was completely full for the entire time we were there. So, what about the food? 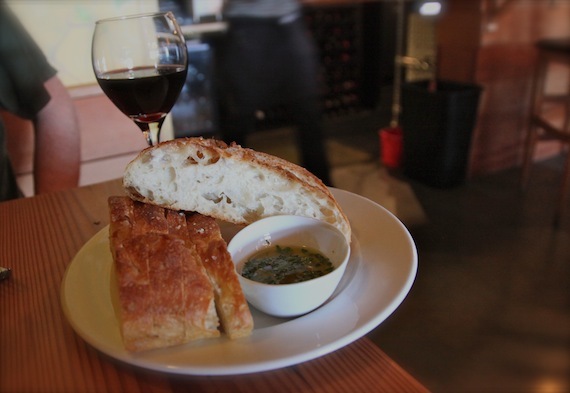 Well, we wanted to try some things we’d eaten on our last trip for an informal comparison so we kicked off with the Little Slab O’Foccacia and Olive Oil. And (drum roll) it was exactly the same as before. Perfect bread, fragrant oil. Yup, this was amazing. Then, we decided to take advantage of the half-orders so we got three entrees between us. The “old” Portobello didn’t have pizza on the menu, and the server told us that the had one of the finest bakers in Portland as a chef so we were compelled to start with the Patata Pinoli Pizza, an interesting-sounding concoction of caramelized onion, potatoes, pine nuts and fir tips. 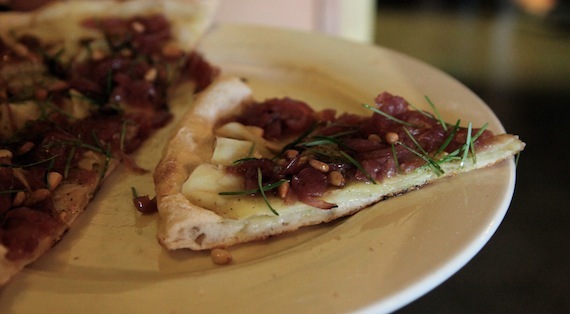 The thing was incredible – I’d had very few pizzas with potato so could not really compare it to anything I’d eaten before. The crust was chewy, and the flavors and textures on top were like sitting in a vegetable garden while in a forest: the potatoes and fir tips are an inspired combination. 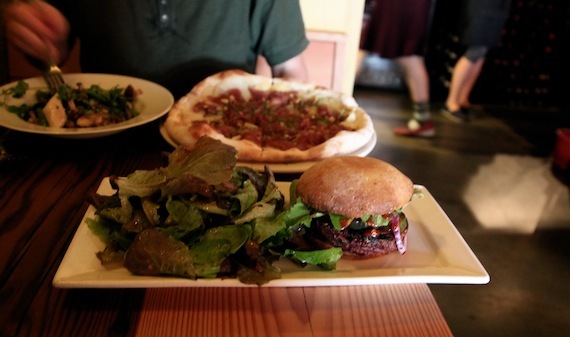 Next up we got the Beet and Veggie burger, with a Li’l Gem salad. This was entirely home made – even down to the bun. The patty was a deep red color, almost like a red velvet cupcake, and was crispy on the outside yet succulent on the inside. Covered in home made carrot aioli, mustard and god knows what else this was one of the best burgers I’ve ever eaten. There fresh salad, home made ketchup (I just can’t bring myself to spell it as “catsup”) rounded off a truly remarkable — for a burger at least — dish. Finally, we dined on the signature Chive-potato Gnocchi with Summery Ragout. This thing was damn incredible. Perfectly prepared and chunky gnocchi was covered in the most tantalizing ragout including fresh leek and even jalapeños. Gnocchi is one of my favorite Italian-style dishes and is terribly difficult to prepare properly in the kitchen as just a few seconds to much or too little of cooking time can ruin it. I can safely say that this is some of the best I’ve ever eaten, and the surprising sauce combo really made the day. 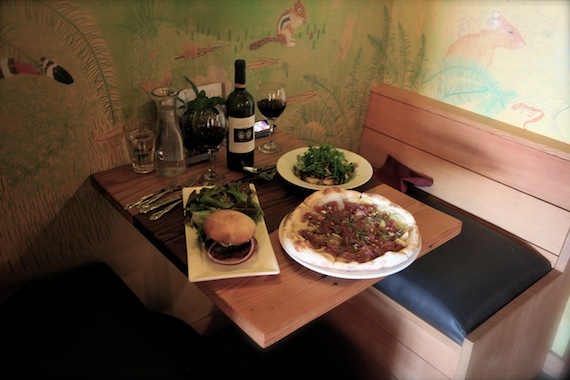 We also ordered a bottle of vegan organic wine (Portobello also has a great selection of local craft beer on tap), which was very tasty and quite reasonably priced, as was the whole meal. 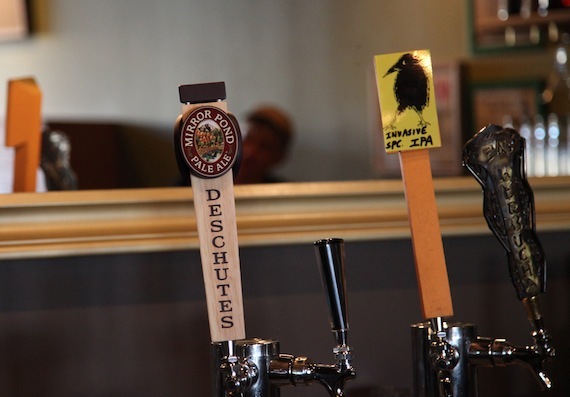 Talking of booze, close by the restaurant are a couple of Portland’s best beer bars: In the same parking lot is Beermongers, and the even more awesome Apex over the street has the largest selection of beers in the city, and a wonderful outdoor patio to enjoy both of Portland’s annual sunny days. 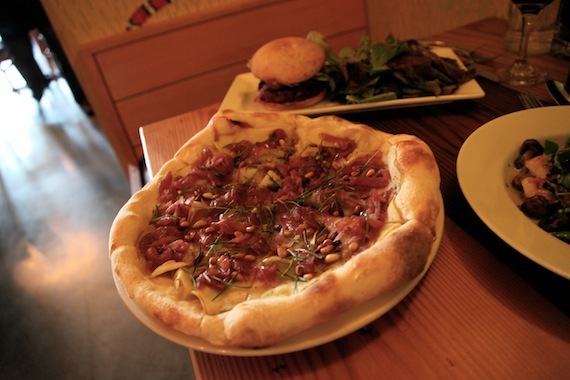 In summary: Portobello is a must-visit location when in Portland. It’s one of those few places (like Candle 79, NYC and Sublime in Ft. Lauderdale) that I’d seriously consider buying a plane ticket just to visit. 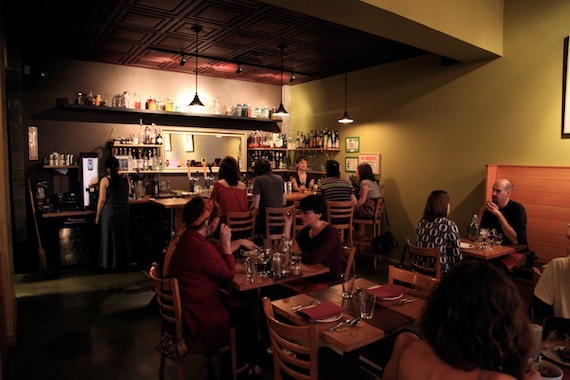 We accept reservations for parties less than 10 folks. We request 24 hours advanced notice. Someone will call you back after 4 pm. Thanks for this review. We LOVE Portobello! The vegan food across the street (next to Apex) at Los Gorditos is excellent too, and very inexpensive. Cheers! Love this place! Only tried it once about a year ago and I crave their gnocchi to this day! 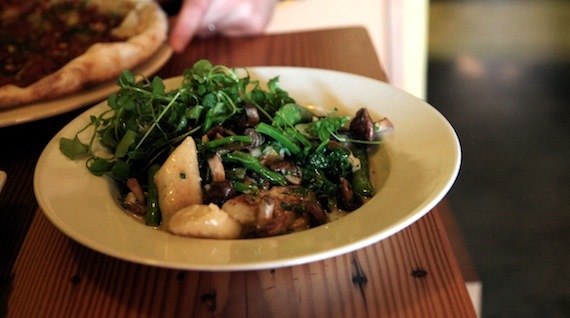 As others have said, I crave Portobello’s gnocchi like nothing else! It is absolutely perfect each and every time (as are their Bloody Marys made with heirloom tomatoes…so, so good) I rarely fly but would drive across the state for one. 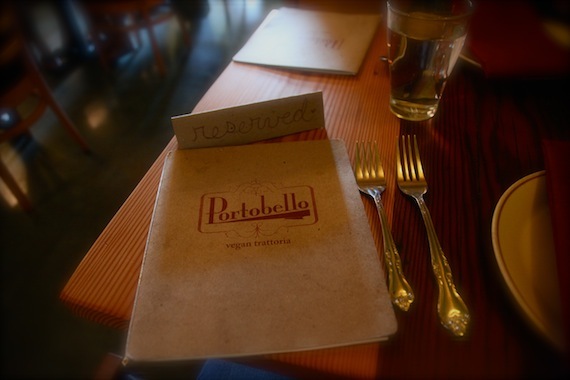 Actually, come to think of it, I DO make the trek from Seattle to PDX just for the purpose of dinner at Portobello. place was the best place we ate! roasted escarole! amazing! spicy, garlicky! awesome! This is absolutely, no question, the best vegan restaurant I have ever been to. Anytime I am getting jealous(!) of a food review (!!) it’s serious! I get emotional when I have the gnocchi-mmmmm! 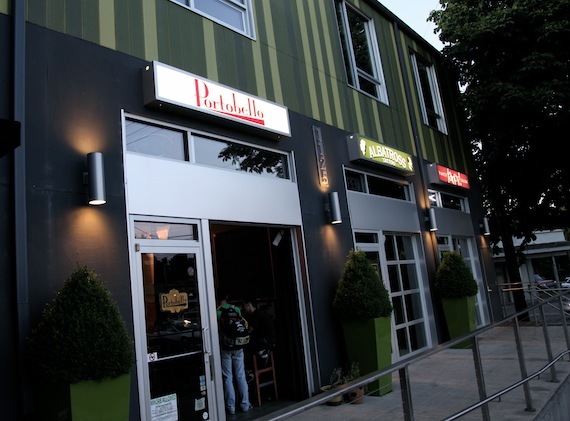 I made the trip to Seattle specifically for The Wayward Cafe and Plum Bistro so next up *will* be Portobello!